Smart Farming or Precision agriculture (PA) or satellite farming or site specific crop management (SSCM) is a farming management concept based on observing, measuring and responding to inter and intra-field variability in crops. 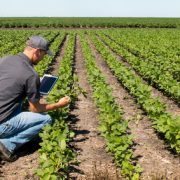 The goal of precision agriculture research is to define a decision support system (DSS) for whole farm management with the goal of optimizing returns on inputs while preserving resources. The practice of precision agriculture has been enabled by the advent of GPS and GNSS. The farmer’s and/or researcher’s ability to locate their precise position in a field allows for the creation of maps of the spatial variability of as many variables as can be measured (e.g. crop yield, terrain features/topography, organic matter content, moisture levels, nitrogen levels, pH, EC, Mg, K, etc.). Precision agriculture has also been enabled by technologies including crop yield monitors mounted on GPS equipped combine harvesters, the development of variable rate technology (VRT) like seeders, sprayers, etc., the development of an array of real-time vehicle mountable sensors that measure everything from chlorophyll levels to plant water status, multi- and hyper-spectral aerial and satellite imagery, from which products like NDVI maps can be made.